The best presents do not come in boxes. My picture with Gloria Steinem is testament to this very statement. This holiday nothing in a box or with a fancy ribbon will compare to the moment captured in the photo. For nearly forty-years I have admired Steinem’s work for its ability to shape a meaningful public conversation. I even use her journey as a model for my own work. It struck me this morning as I reviewed my shopping list for tomorrow’s feast that I’ve learned a thing or two about Thanksgiving. It isn’t hidden in my special recipe for Bourbon Sweet Potatoes. Nor is it found in the holiday meal preparation guide that I’ve read and re-read in the Food Section of the New York Times. It is found in the work that I do everyday, work that more and more looks and feels like a ‘how to’ guide for navigating the emotions our lives. Have you ever found yourself at a moment when you weren’t sure about your next steps? We all get there at some point or another. It can happen suddenly thanks to an unexpected event like the death of a loved one. It can happen in a more planful way when we decide to leave a job or when a child leaves for college. It can happen thanks to a recognition deep down that something just isn’t right. I’ve been fascinated by these moments for the better part of the last five years. I’m convinced that it is these moments that leave us at the doorstep of transition. What do you do when you find yourself at a moment when you’re not sure how to proceed? I smile politely when I meet these people. I will never convince them otherwise. For those willing to respond to uncertainty with an open heart, I’ve learned that these moments are enormously important opportunities in our lives and in the lives of those we touch. It is at these junctures that we have an opportunity to grow; to re-calibrate our voices; and to contribute more of our unique gifts to a world desperately in need of such contributions. A simple one. Trust ourselves enough to bring voice to those things that hold value and meaning for us. Whatever this is or wherever it may lead. One woman in my research told a powerful story recently that spoke to this task. Hers started with a wrenching and destabilizing moment. Lizbeth made a decision to move away from academia. She described that decision as momentous. She wandered a bit. She needed to excavate and exercise her voice. It was circuitous. Messy. She got a little lucky. She slowly made progress. “I think I also got to the place of accepting not knowing.” She imagined all sorts of possibilities and gave herself the permission to try. I now think of uncertain moments as invitations. We can accept or decline them. Accepting can be downright scary. Could acceptance be viewed as an act of courage? We live in a time that shuns those who are in a place of ‘not knowing.’ Think about it. How often have you felt the need to communicate to others that you’re on track? Heading in the right direction? Engaged? Successful? These social norms can also direct us to ‘go quiet’ when our paths open up to uncertainty & possibility. The irony in all of this is that our voices falter even more if we react to uncertainty with silencing our voices. “I am finding my voice.” Said a 51-year-old woman to me the other day. Imagine that. Her comment was unprompted. I wanted to cheer out loud. Next time you find yourself at a moment with no clear path forward, take a minute to recognize it as an opportunity. Trust your instincts about what may be at play. See if you can’t use your voice to take one step in the direction of an imagined possibility all your own. Is it time to turn up voice’s volume? © 2017 Linda Rossetti & NovoFemina.com. All rights reserved. No content on this site may be reused in any fashion without written permission from NovoFemina.com. I’ve learned over the past four years that the word, ‘transition,’ is a loaded term. We use it to describe everything from the vital first efforts of a new presidential administration, a.k.a. a transition team, to the heavily scrutinized transition of celeb, actress and athlete Caitlyn Jenner. 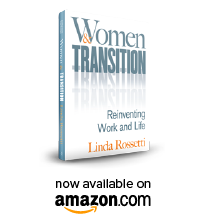 What does transition mean for you?